Qantas partner Alaska Airlines is the fifth-largest airline in the US. It generally ranks towards the top of US airlines in terms of customer satisfaction and its loyalty program Mileage Plan is more often than not the winner in annual rankings. 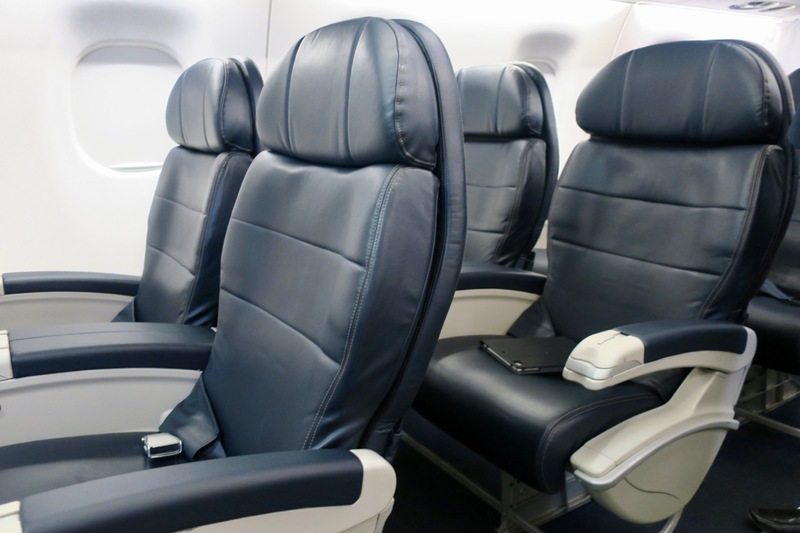 Note that ‘First Class’ on domestic US flights is equivalent to Business Class elsewhere. The two airlines will become one under the Alaska name from 25 April 2018. Virgin America’s Elevate loyalty program was merged into Alaska’s Mileage Plan program in January 2018. 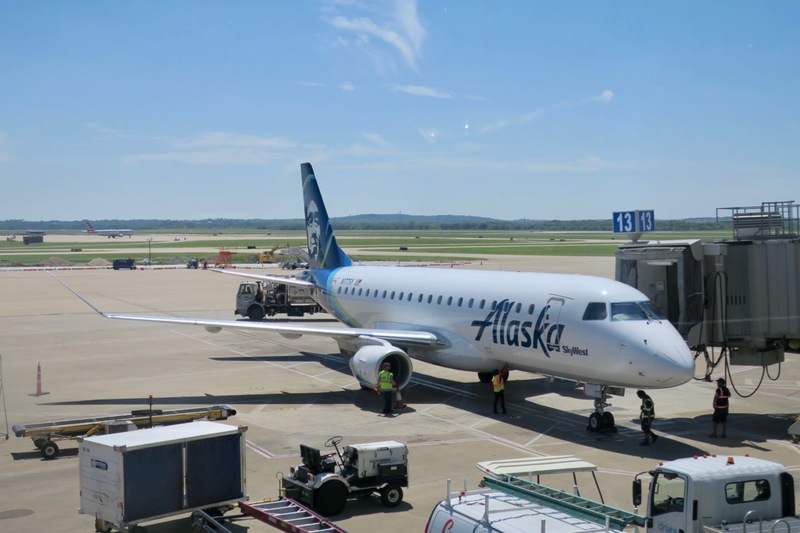 Alaska flies to more than 115 destinations within the continental US, Alaska, Hawaii, Canada, Mexico and Costa Rica. They have a strong presence on the West Coast of the US, with Seattle as their main hub and secondary hubs in San Francisco, Los Angeles, Portland and Anchorage. Virgin America’s inclusion will strengthen the airline’s presence in San Francisco and Los Angeles as well as add Dallas Love Field (not Dallas-Fort Worth) to the network. 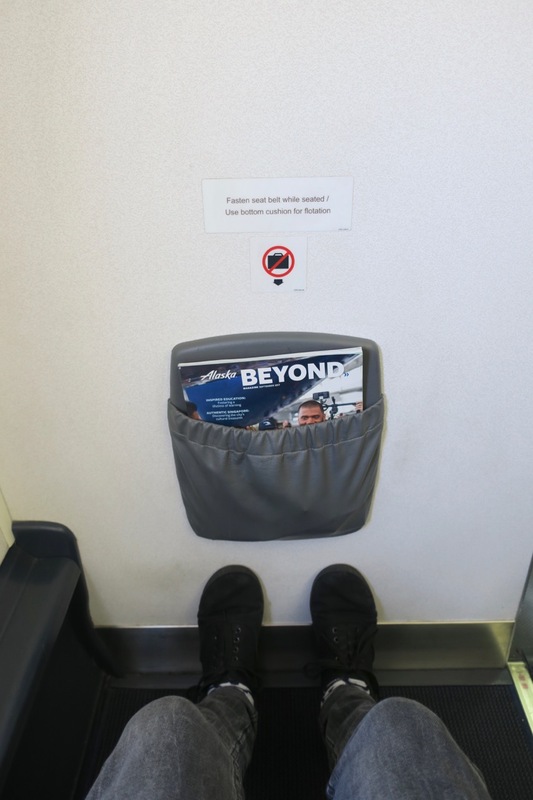 Most aircraft are single-aisle Boeing 737s or Airbus A320s, with some smaller jets operated by subsidiaries Horizon Air and SkyWest (this review). 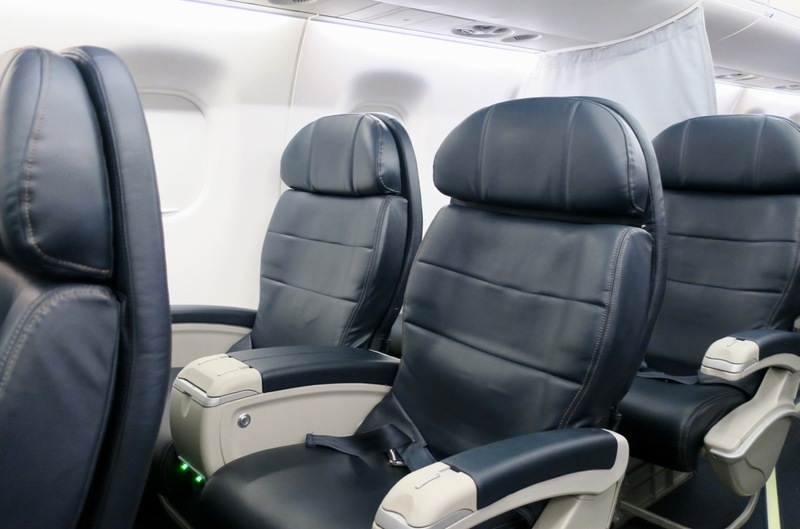 On smaller jets like the Embraer 175 that I flew on, First Class is arranged in a 1-2 configuration. 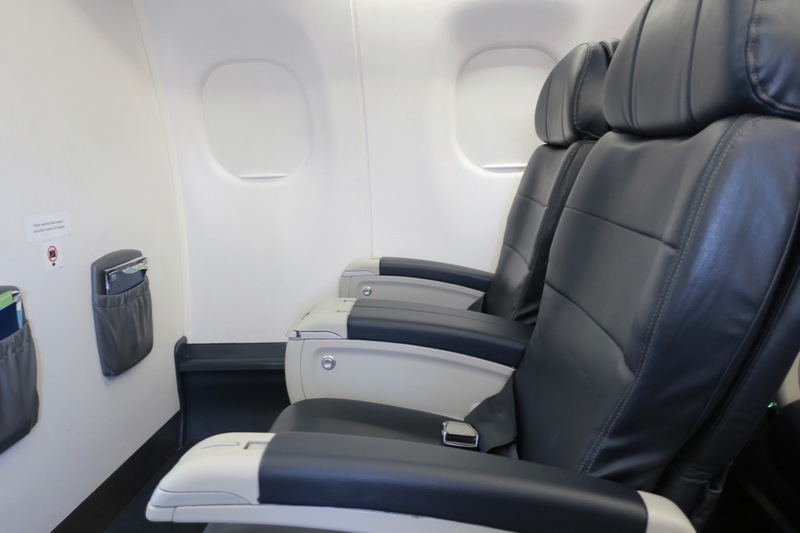 However, on larger jets like a Boeing 737, you will find a more standard 2-2 configuration. I found the seats and cabin to be new and comfortable. 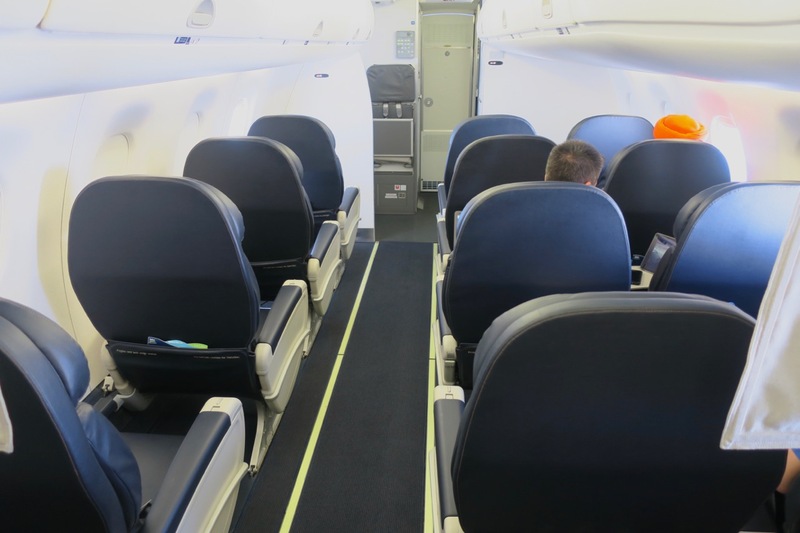 Avoid Row 4 as only a curtain separates the First and Economy Class cabins. 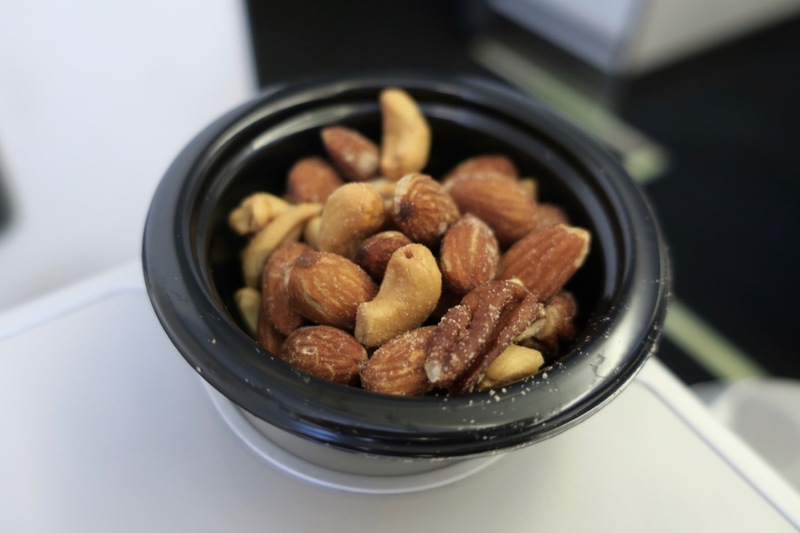 I received warm nuts after takeoff. 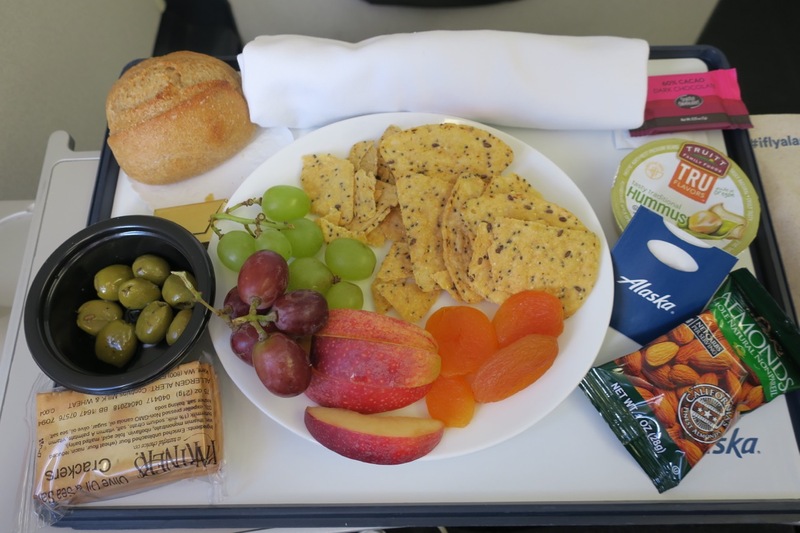 You’ll get a meal on longer flights. The flight attendant on my flight went above and beyond to put together a vegetarian meal from the for-purchase snacks available in Economy. A disappointment was that the coffee was served cold and the cabin crew knew it and did not rectify the situation. The friendly ground crew introduced themselves by name over the loudspeaker and the cabin crew allowed an Economy Class passenger to put her wedding dress in the First Class closet, so thumbs up for that. 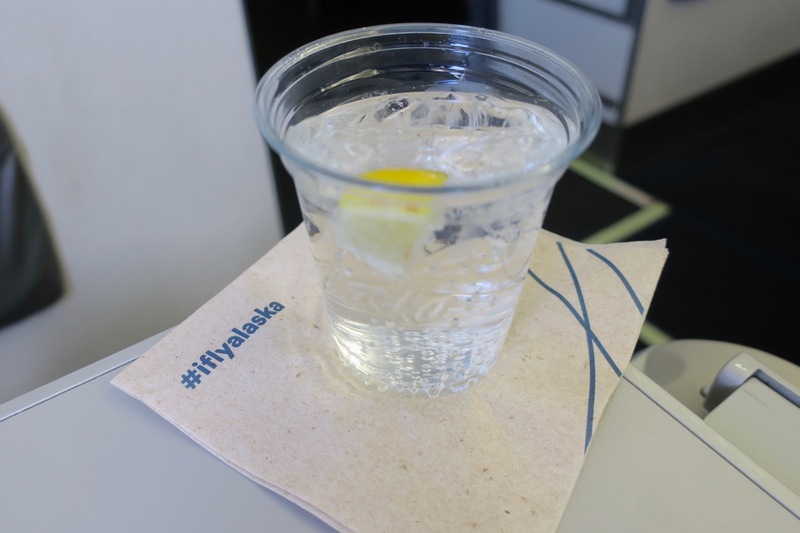 A hot towel provided prior to the food service was a nice unexpected touch on a US airline. It took five minutes for my tray to be cleared, which is neither here nor there. No seatback televisions or handheld tablets are provided. However, the wifi allows for the free use of messaging apps like Facebook Messenger and WhatsApp. You can pay for more access but it may not be worth it—the wifi on my flight had very poor speeds of 0.06 Mbps download/0.18 Mbps upload. 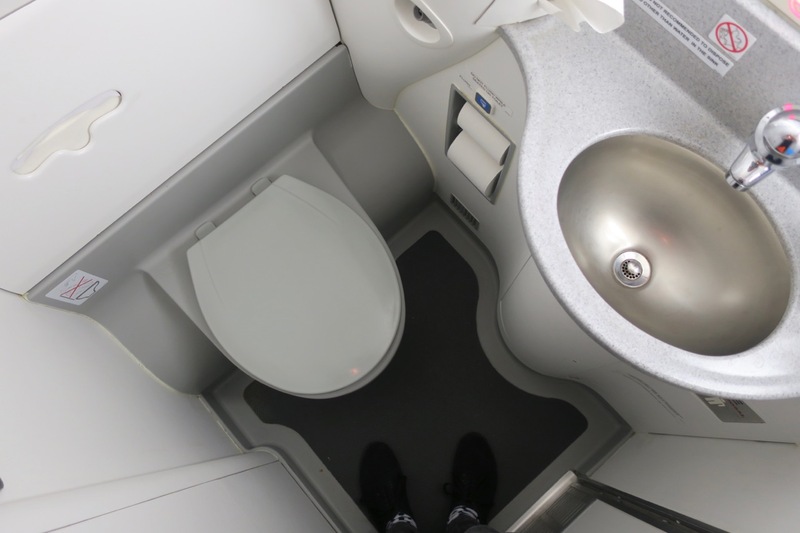 Due to the curvature of the small plane, it was hard to stand upright in the tight bathroom. 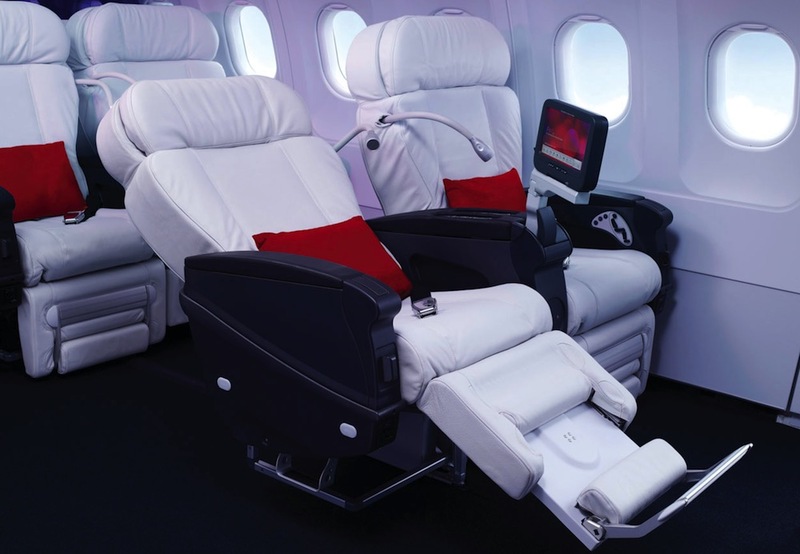 Alaska plans to update its First Class offering in 2018-2019 as it absorbs Virgin America into one brand. You can search for award space and book seats on Alaska through any of the programs above except British Airways, who you have to call. You can read our guide to when award calendars open. Regardless of the program you book through, taxes should be $5.60 USD per segment of your trip. 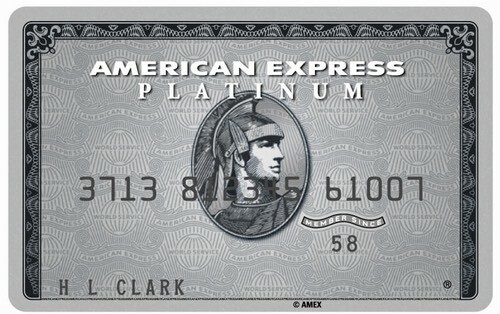 It may also be worth checking to see if you can get a good cash price on an Alaska Airlines flight. 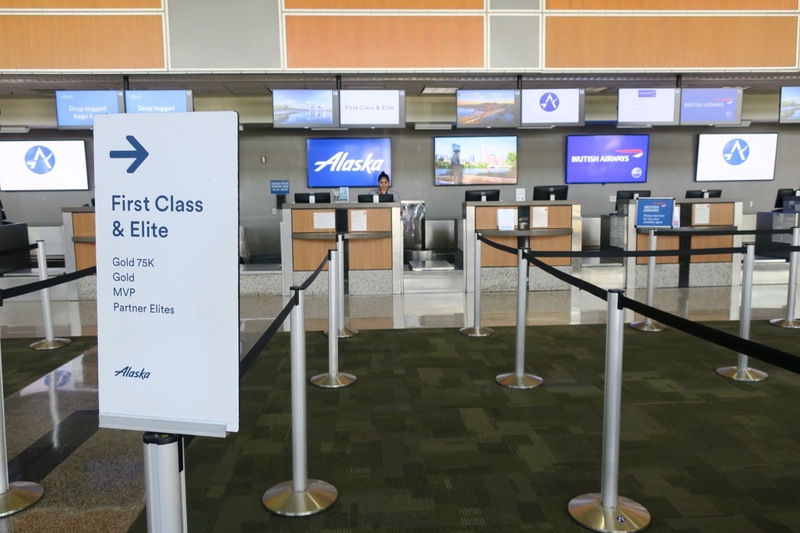 One differing feature of Alaska to other US airlines is that First Class passengers get access to Alaska lounges before their flight, whether travelling on a paid or award ticket. Note, however, that upgraded passengers do not get access. For short hops like LA to San Francisco or Las Vegas, perhaps only use your British Airways Avios to maximise value. 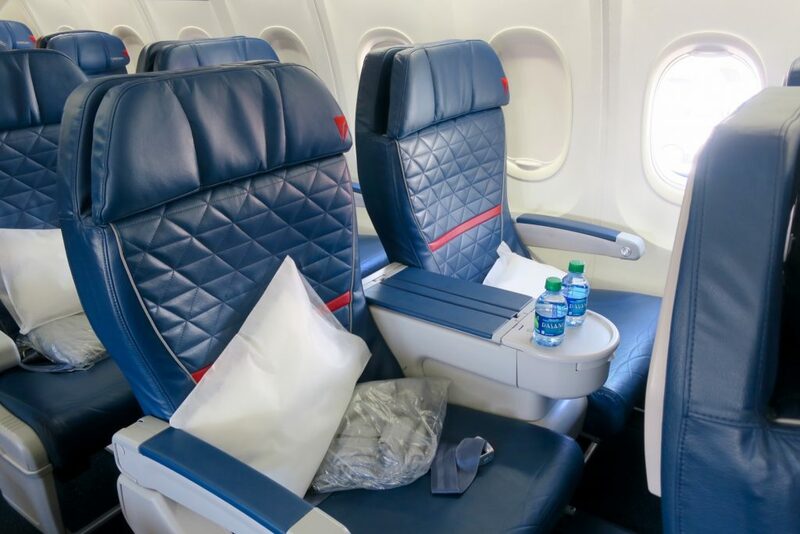 If you are doing the five-to-six-hour trek across the country, it is worth checking if you can secure a seat on an airline with a lie-flat seat, including Delta, United, American Airlines and JetBlue—it makes the journey a whole lot more comfortable. 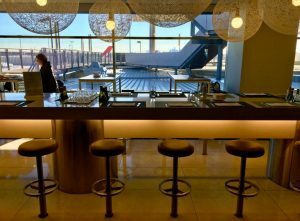 Having said that, with Alaska, you’ll get access to a lounge before your flight, generally good customer service and relatively modern planes.